WHAT DO YOU DO WITH THE HUGE AMOUNT OF DATA THAT COME FROM YOUR CHECKWEIGHERS and METAL DETECTORS? Unlike other vendors who will happily sell you detection equipment and checkweighers, we are the only ones that have total integration services , both software and hardware, to an FDA approved SPC system. 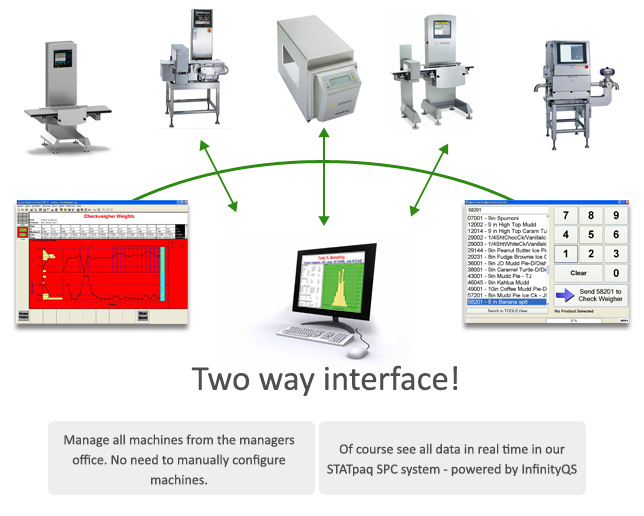 Our STATpaq SPC/QA HACCP system has our exclusive interfaces that will give you TWO WAY communication between our checkweighers and metal detectors. These interfaces not only allow you to see all streaming data on your network in real-time, but allows the managers to BROADCAST product changes and updates to the machines so they are all on the same database and eliminates the need to go to each system to adjust for new or updated product specs. Please click below to go to our SPC page for further integration information. Our STATpaq SPC system can READ TO and WRITE from our detection machines and checkweighers. We have robust, exclusive interfaces that we have written specifically for Sartorius and Anritusu machines. If you already have checkweighers and metal detectors, we can interface them as well- but legacy machines can only be integrated one way- from the machine to our SPC system.